Final Weeks of Spring Training! 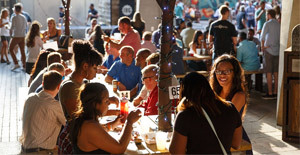 Center City District Sips is almost here! Starting June 7, from 5-7pm every Wednesday, enjoy $5 cocktails featuring Effen Vodka, $4 wine, $3 beer and half-priced appetizers all over Center City! Get the full list and specials at CCDSips.com. Visit the CCD Sips Style Guide for tips from our experts and Wednesday-only deals from Center City's top salons and shops, so you can hit your favorite CCD Sips spots in style all summer long. Sponsored by Effen Vodka and American Express. On May 17, businesses and animal lovers across Philadelphia will come together for a daylong fundraiser in support of PAWS’ lifesaving efforts. Restaurants, shops, and more will donate 10% of proceeds to bring Philadelphia closer to becoming a no-kill shelter city for vulnerable animals. Visit the website for a complete list of participants. The Brews & Views: Spring Rooftop Mini Series at the Free Library begins May 18. Every Thursday, 5-9pm, enjoy drinks on the Free Library's Skyline Terrace and take in spectacular views of the city from this spring rooftop beer garden on the Parkway! Local craft beers, wine and refreshing cocktails are available to purchase along with a menu of snacks from Brûlée Catering. Entertainment will be provided to get everyone energized. Join the event page on Facebook. On May 21, 1-5pm, enjoy a delightful, self-guided walking tour of a full array of private homes and gardens in historic Society Hill. View architectural and interior styles ranging from the 18th-19th Century to contemporary. All open house tour ticket holders may also enjoy a 15% discount for dinner after the tour at four area restaurants. Advance ticket purchase is suggested. Tickets: $35 per ticket in advance; $40, at the door. Group rates for five or more available. Call 215.629.1288, or email: mattdejulio@aol.com. All proceeds benefit Society Hill Civic Association. From May 30-June 2, help assemble The People's Tower! Over four days of workshops, the public can work with internationally renowned French visual artist Olivier Grossetete and the Kimmel Center to construct the cardboard building blocks that will come together to create a tower in Dilworth Park on June 3. To reserve a spot in a workshop, click here. The 1,400 cardboard boxes and 18 miles of masking tape will rise into an 88-foot monumental-community-performance-architectural temporary structure evocative of Independence Hall. But art is fleeting - The People's Tower will be demolished on June 4 with your help.